Walking through the beautiful rhododendron Forest. Langtang Valley Trek is one of the most popular trekking area in Nepal. The Langtang valley is the superb trekking destination that packs a lot of scenic punch into a small amount of time. The massive snow capped mountains and the beautiful glaciers are the attraction of the trek. The Langtang Village trek also offeres you the panoramic view of high mountains which is just fabulous. 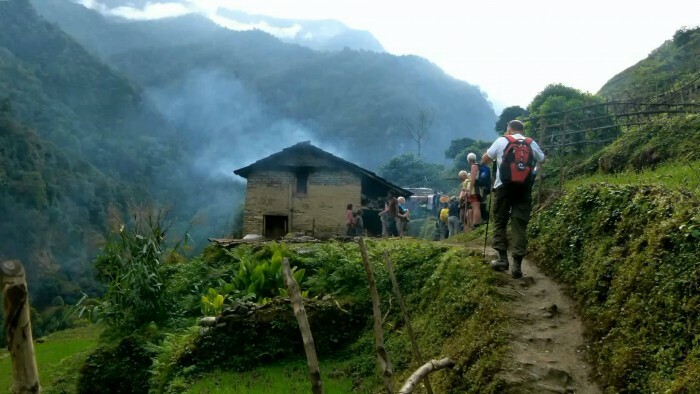 This trek is the journey to wilderness and one of the wildest trek in Nepal. The trail is full of natural beauties and Adventures. Langtang Valley is located only 19 miles north of Kathmandu. The whole valley is dominated by Mt. 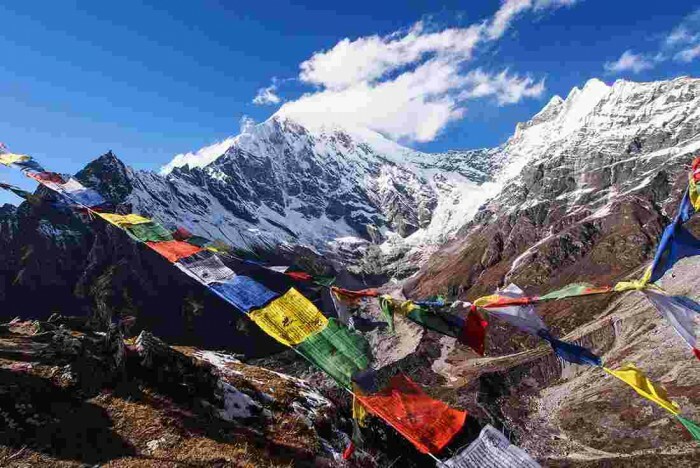 Langtang Lirung and offers Pine forests, rugged rock, swift mountain streams and snow capped peaks. Few hours drive from Kathmandu will take us to the beautiful Langtang Valley. Langtang valley is one of the closest place from Kathmandu valley where you can see huge snow-capped mountains and gorgeous glaciers. Tibetan culture is seen in this villages, as the valley lies near to the Tibetan boarder. Trekkers have chance to explore the natural beauties as well as the culture and traditions of the peoples. The starting point of the Langtang Trek will be Syabrubeshi. From here we will follow the Langtang River to the east until we get to Kyanjin Gompa(3,880) - The old Buddhist Shrine. Heading up a gentle slope, we pass along the dramatic ridges through local villages inhibited by Tibetan, Tamang and Sherpas. Then we will cross the lush forest of Rhododendron and oaks. When we reach the Langtang valley, we will find the flapping prayer flags in the track, brightly painted shortens and Mani walls where yak herders welcomes you to the land of these high mountain peoples. Langtang Lirung, Langsisha, Ganja La Peaks are the point of attraction that we can see during the trek to Langtang Valley. We will have the amazing view of glaciers on reaching the Langtang valley. Langtang valley was badly affected by the Earthquake in 2015 but now it is recovered and fully safe. You can have the excellent experience in this trek. This is very suitable for those who wants to explore the panoramic views of mountains and beautiful glaciers in short duration. Accommodation in mountain lodges during the trek. Welcome to Kathmandu. Our representative will be there to transfer you to the Hotel. You will have short briefing at the hotel. Relax the rest of your time in Hotel. Dinner at Hotel. Overnight stay in Kathmandu. After having breakfast, we will head to Syabrubeshi enjoying the views of landscapes along the Trishuli River. We will have lunch on the way. After 7-8 hour drive we’ll reach Syabrubeshi where we will have dinner. Overnight stay at Hotel. After having breakfast, we will begin our trek to Syabrubeshi along the Langtang Khola. We ascend and descend simultaneously through beautiful oak and rhododendron village. After crossing the bridge on Langtang Khola, we ascend on a steep trail which leads us to the Lama Hotel. Dinner and overnight stay at Lamahotel. Our trip continues ascending from Lama Hotel enjoying the mountain landscapes with abundant waterfalls. We will start to see the white peaks of Langtang range after reaching the green meadows of ghoda tabela. Our trail continues to climb up the widening valley, passing the settelements used by herders. We pass the Buddhist Monastery which was affected by the Earthquake in 2015. Overnight stay in Mundu. After breakfast we will start our journey to Kyangjin, a principal monastery of the region. We pass water mills, prayer wheels, chortens, with sacred mounds of rocks withy inscriptions carved on them. We will also pass by the largest Maniwall of Nepal. After short trek, we rest on the afternoon exploring the Buddhist shrine in Kyangjin Gompa and surrounding areas with the eye catching views of the mountains. Today we spend full day exploring Tserko Ri which will also helps us acclimatize to the high altitude. The trail passess through yak pastures and ascends to Tserko Ri. We can experience the sunrise view from the top of Tserko Ri. 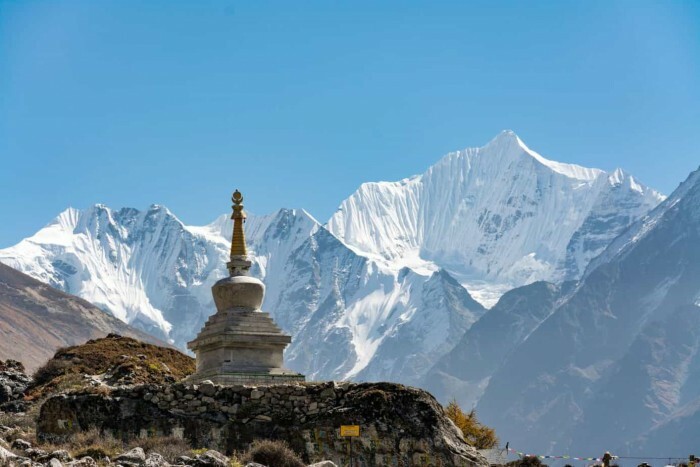 We will bw back to Kengjin Gompa by late afternoon and explore the beautiful monastery enjoying the view of Himalayas, Glaciers, Birds Yaks etc. We will retrace the same route to reach the Lama Hotel. Today, most of our trek will be downhill through forests and beautiful villages. We have the chance to enjoy the eye-catching views of Himalayas that we missed while climbing up. Overnight stay at Lama Hotel. We will have easy trek today as the route goes almost all downhill. We will reach to Syabrubeshi retracing the same path we climbed. Overnight at Syabrubeshi. We will drive to Kathmandu enjoying the beautiful views from our vehicle. We reach there by 7-8 hours. Relax on hotel. Overnight at Kathmandu. Today our trek ends. Our representative will take you to Tribhuwan International Airport in time.